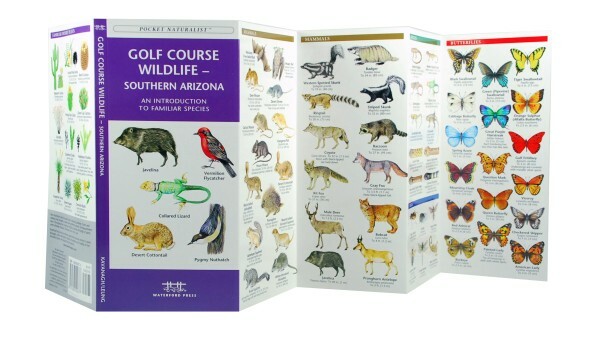 Golf Course Wildlife, An Introduction to Familiar Species, is a beautifully illustrated guide from Waterford Press that highlights over 140 familiar species of birds, mammals, reptiles, insects and desert plants. This item is part of our Special Order guides collection. A quantity of 10 or more guides must be purchased, but can be mix and match. Please email if you are interested in a purchase of 10 or more guides. For many, golf courses are sanctuaries where one can enjoy a few hours of relaxation away from the demands of day-to-day life. Courses in southern Arizona are also sanctuaries for wildlife. Golf Course Wildlife - Southern Arizona is the perfect pocket-sized, folding guide for the golfer/nature enthusiast. 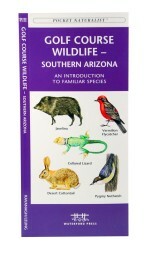 This beautifully illustrated guide highlights over 140 familiar species of birds, mammals, reptiles, insects and desert plants. Laminated for durability, this handy Pocket Naturalist Guide from Waterford Press is a great source of portable information and ideal for field use by novices and experts alike.